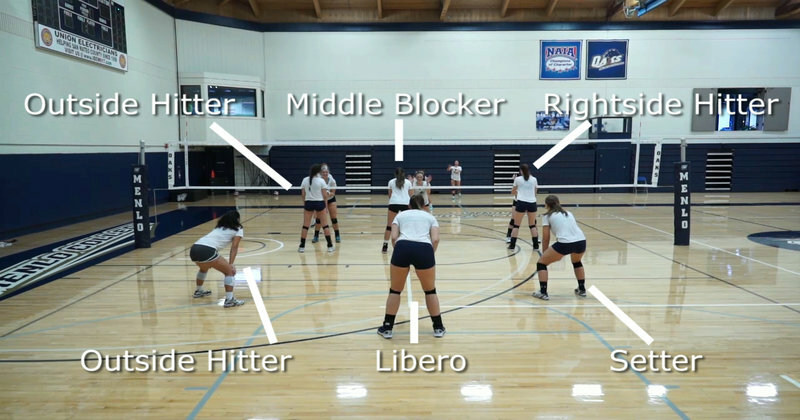 If you prefer to watch a short video explaining the various volleyball positions, click here. Ah, Volleyball Positions – one of the most important aspects of the game for beginners to learn. You’ve seen it, and perhaps even played it, in your physical education classes, or on the beach, or even in a recreational or competitive league representing your community or school at a club or varsity level, but you’re confused about how to play volleyball well with all of its positions, roles, formations and rotations. It is a sport that combines strategy, skill, and social interaction in a non-contact environment. It is accessible to many due to its popularity and relatively low equipment and space costs. Teamwork, problem solving, communication, even improvisation in the heat of the moment – it’s all there! Two teams, consisting of 6 players each, oppose each other in a defined-boundary court that is divided equally by a net. The object of the game is to hit an inflated ball over the net into the opposing team’s side of the court in a “rally”, such that the ball is “grounded” (i.e. it touches the court surface within the opposing team’s court boundary) or otherwise cannot be returned back over the net to the other team’s court on the opposite side of the net. Each team is allowed to touch the ball up to 3 times on its own side during a rally, with the third touch having to be the one getting the ball back over the net (if the previous two touches did not do so). The team that gets the ball over the net to the opposing side, such that it cannot be returned (via grounding or an inability to return the ball within three touches) is awarded a point. Easy, right? Well, yes… and no! One of the good things about volleyball, as mentioned above, is that it is accessible by many. It can be played in a social, recreational environment in which the goal is to get some exercise and have some fun – which is great! However, some knowledge and skill building in the complexities of the sport can take your interest and enjoyment to a new and higher level. What knowledge and skills are we talking about? Like many team sports involving multiple players, volleyball has specialized player positions, roles, and strategies that can be used in various game situations. These effectively use the available talents and skills of the players to maximize a team’s chances of winning a point, defend against an effective attack by the opposing team, and win the match overall. Let’s take a look at the court layout, the general flow of the game, the various positions and roles in terms of offense and defense, as well as formation use and strategy. Free Zone – usually a 3 meter-wide area surrounding the entire court in which the ball can be played during a rally. On a side note, many public and school gymnasia have multiple sets of lines on their floors for different sports, such as basketball, badminton, handball and so on. While confusing visually at first, players and coaches can easily become accustomed to “seeing” only their specific lines in the heat of the match or practice. The sport of volleyball has lots of terms and definitions, but key to the discussion is the distinction between “offense” and “defense”. The opposing teams transfer from offensive strategy to defensive strategy very quickly during a rally! It is simple to keep track, though – when one team has the ball and is trying to score a point, they are on “offense”, while the team trying to prevent the opposing team scoring is said to be on “defense”. As soon as the ball crosses the net to the other side, the teams are said to have switched from offense to defense and vice versa. Remember from above the simple concept of the game? The object of the game is to hit the ball over the net into the opposing team’s side of the court in a rally, such that the ball is “grounded” or otherwise cannot be returned back over the net. Each team has a maximum of three “touches” on offense to get the ball back over the net in a rally, but the flow has as a general look and feel to it. The team receiving the ball (either via a serve from the other team to start a rally, or during a rally itself) usually “digs” or otherwise stops the ball from hitting the floor (i.e. being “grounded”). This first touch is considered a “pass” to another player for the team’s second touch. This second touch is considered the “set”; as the name implies, it is designed to set up the third touch – the “attack” – in the best possible way to maximize the chance of the third touch getting over the net and grounding on the opposing team’s court. During this time, the team on defense waits, watches, and attempts to arrange its players to receive the third “attack” touch from the opposing team. The rally can continue for as long as necessary between the two teams until the ball is grounded or otherwise is unable to be returned to the opposing team’s court. It should be noted here that while usually the team on offense uses its maximum three touches, it does not have to do so. For instance, if an opportunity presents itself to score a point only after two touches, either as a strategy to catch the opposing team off guard or even to simply save the ball from being grounded, this is allowed (with certain restrictions on which player gets the ball over the net – more on that later). The diagram above shows numbered court positions on one side of the court (called “zones”), with volleyball positions on the other side. It is important to note here that the player positions may move about the court during a rally, with certain restrictions in the rules as to who can attack whether they are in the front row or the back row at the time of serve. For reference purposes, the court positions or “zones” are imaginary fixed spots numbered 1 through 6 in order to discuss and implement formation strategy. The setter is, in general, a volleyball position where the player is a leader on the court on terms of flow of play. You may recall from above that a team has three touches available to them in order to get the ball back over the net and “grounded” on the opposing team’s side. The setter usually receives the ball via a “pass” (i.e. the first touch) in order to have the second touch of the ball. The setter’s main responsibility on offense is to place the ball in the air well for the third touch by their attacking fellow teammate. When his/her team is on defense, the setter watches the flow of play from their assigned area (or zone) and must be ready to defend their area from attack either at the net or in the backcourt – however, the setter must be able to transition quickly from defense back to offense by getting into position to receive and set the ball. The middle blocker transitions to the middle hitter, depending of course on whether his/her team is on offense or defense at the moment. On offense, they perform fast attacks close to the setter (often attacking the ball on the third touch from the setter before the ball’s trajectory reaches the peak of its arc). The middle hitter must be able to judge and adjust their approach to the ball for the third touch, reading the setter’s actions well. Furthermore, they must be able to keep an eye on the opposing team’s defensive set up in order to place the ball in a high-chance grounding area. This may be an open space on the court, or in an area where the team feels it is not being defended well by a particular opposing player. On defense, the middle blocker’s main responsibility is as the position’s name suggests: block the opposing team’s attack. Not only does the middle blocker have responsibility for his / her team’s Zone 3, he/she also moves from side to side to assist with double (i.e. two players) blocking an attack from the sides of the court near the net. As such, they often are tasked with coordinating the frontcourt players for blocking. Outside hitters can play in both the back row and the front row. On offense, they often score a number of the points via the attacking third touch; while on defense, they often receive the ball during the serve (along with the Libero). On offense, the outside hitter will often go to the left side of the net (the Zone 4 area) in order to receive the set from the setter. Similar to the middle hitter, they must be able to judge and adjust their movements in order to meet the set and be able to observe the opposing team’s defensive weaknesses while attacking. On defense, the outside hitter is a key blocker in concert with the middle blocker. If they are in the front row, their prime responsibility is to block the attack down the sideline (while the middle blocker angles to protect the center of the court simultaneously). As the name suggests, this position in volleyball plays “opposite” from the setter in the rotation (more on that later). The opposite is a well-rounded player who possesses all of the skills necessary for both offense and defense – they may not be considered as having the best development of a particular skill, but are competent in all aspects of the game. On offense, the opposite mainly attacks from the right side of the court. In addition, they sometimes have the role of the back-up setter if the main setter is unavailable for some reason. Most often, opposites are not involved with service receiving and passing. On defense, the opposite has blocking responsibilities on the right side and serves as the primary blocker against the opposing team’s outside hitter. In similar fashion to the outside hitter, the opposite protects against attacks down the right sideline and works in concert with the middle blocker on double blocks. The libero is a specialty position in volleyball, focused on defense. Formally introduced into the sport of volleyball in 1998, the libero plays only in the back row (usually in Zone 6) and wears a different color of team jersey to distinguish him/herself from the other players. In addition, the position has special rules that allow for this player to come in and out of games to replace a back row player at the coach’s will without having it count as a formal substitution. Usually, the libero substitutes the middle blocker in the back row. On offense (wait a minute, didn’t we just say that the libero is a defensive specialist? ), yes the libero contributes. The main skill of the libero is “passing”, or the first touch, either from receiving the serve or defending the attack from the opposing team. With that said, the libero may not attack the ball if it is above the height of the net, nor serve the ball to the opposing team. It is on defense where the libero position shines! This player is the best defender on the team, with exceptional ability to react to the opposing team’s attack, dig, and pass the ball to the setter. However, in contrast to its defensive role, the libero is not allowed to block. So, you’ve read about the flow of the game, the zones and volleyball positions… how do you put it all together? Formation uses, and the strategies for each formation, are critical in maximizing your team’s talents and enjoyment of playing the sport. All players can contribute with their unique skills depending on your desired formation! For instance, the setter may have been in the service position for his/her team’s previous serve; in the example above, the server now MUST go to the Zone 6 position for his/her team’s next service. It is critical to understand that once the ball is served, the setter (and the rest of the players as well) may move to their assigned role spots on the court surface, with the following caveat: players who started in the back row on the serve may NOT attack the ball in the front row. If they do become involved in an attack, they have to have started the attack BEHIND the attack line (see the diagram of the court layout above for reference). This is important as we consider formations and strategies! Traditional naming of formations in volleyball follows a two number system, with the numbers divided by a dash. The top three formations are 5-1, 6-2, and 4-2. In this system of numbering, the larger numbers refers to the number of hitters, while the smaller number refers to the number of setters. The back row rule for players described above has an impact on each of the formational strategies. Let’s look at the three top formations in volleyball and discuss the strategy involved. This formation tends to be the most used in competitive volleyball – specifically, one setter and 5 hitters. What are the advantages and challenges? The 5-1 formation has the advantage of having only 1 setter. This means that the other players know the setter and his/her strengths, and the setter in turn knows his/her hitters and how to maximize their talents. This may work well for a “power” team that has a wealth of effective hitters, but fewer accurate setters. In the 5-1 formation the setter, as we found with the back row rule, CAN make the set from the front row after the serve if they started in the back row, but CANNOT be an attacker. As such, there is a higher demand on the other players to be able to set as well (which they may not be as able or capable of doing). As such, as the 5-1 formation rotates, the setter cannot use their full talents all the time on the court. This formation is used to maximize setters who also have attacking skills on your team – specifically, the two setters available play opposed to each other in the formation (i.e. if one setter is in Zone 1, the other setter is in Zone 4 in the rotation). How does this help, and what are the challenges? In the 6-2 system, the fact that you always have a setter in the front row means that the setter can also be a hitter (i.e. an attacker). As such, the defense can be kept off guard, in that the setter can change even if the team does have a preferred setter. This can be very valuable in close games when you need a clutch point and/or to force a side-out! 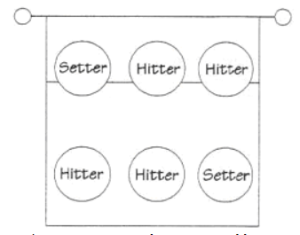 In contrast to the 5-1 described above, 2 setters mean that your hitters have to know, and be able to adjust their movements to 2 different players. Furthermore, one setter may not be as accurate or powerful a hitter, thereby “weakening” the potential for attack. The 4-2 formation is often used at the beginning of the season with new players on a team, or perhaps with teams that have beginner players. This formation is considered to be the easiest to implement in terms of maximizing talent on your team. That is not to say that it cannot be effective, however! 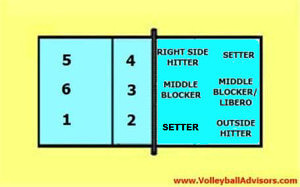 Similar to the 6-2, the 4-2 uses two setters who can be in each row in the rotation. Once again, this can maximize talent on your team for setting up attacks. A true 4-2 is easier to read from the defensive side; it will be easy for a team on defense to know which player is the setter in a game. That is not to say that the setter cannot attack per se, it is just that they become known to not have the same attack skills as the other players. More often than not, when the setter does get the ball back over the net, it is considered a “dump” (a setter tactic involving tipping the ball over the net, often considered a surprise tactic). Well, you’ve had a great exposure to volleyball and its intricacies! From court dimensions and lines, to flow of the game, to player positions and formations, volleyball is a fantastic team sport that can bring out the best in you, your teammates, and – dare we say it – your opponents too. Use this article as a launch pad; get out there and go deeper with a ridiculously fun game!